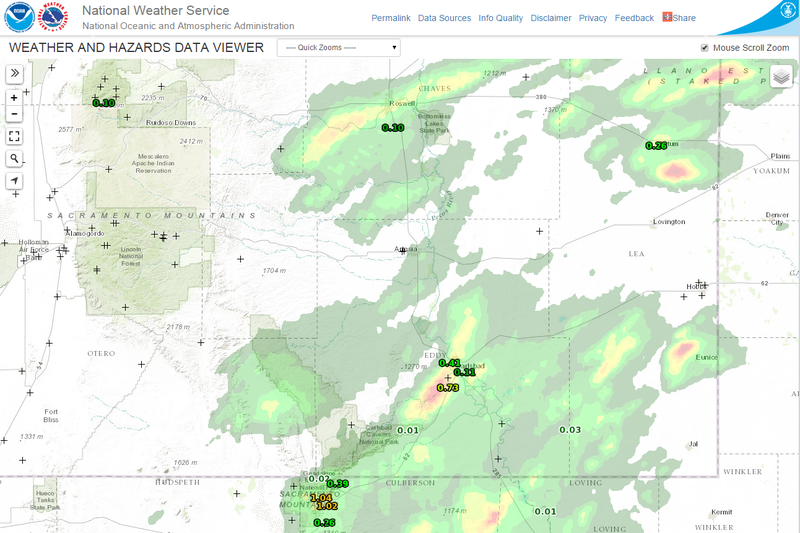 NWS MesoWest Repotted 24-Hour Rainfall Totals. And Radar Estimated 24-Hour Rainfall Totals. As Of 5:30 AM MDT This Morning. Another scroching day was noted yesterday. My high temp here at our home in Carlsbad was 101°F. Long term average high temps for the date locally are in the mid to upper 80's. 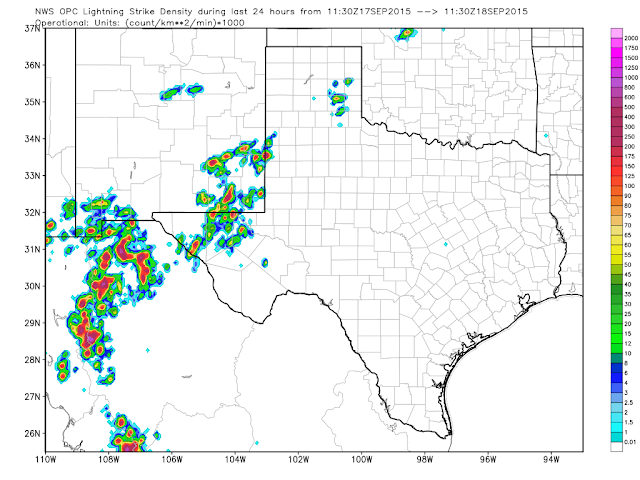 Thunderstorms broke out over the southeastern plains yesterday afternoon and dissiapted later in the evening. Rainfall was fairly widespread but as the graphic above indicates the heaviest rains missed the populated areas once again for the most part. I measured .41" here at our home and I had a report on FaceBook of .90" in Carlsbad.The Bowl Raws located just north of Guadalupe Peak picked up 1.04". 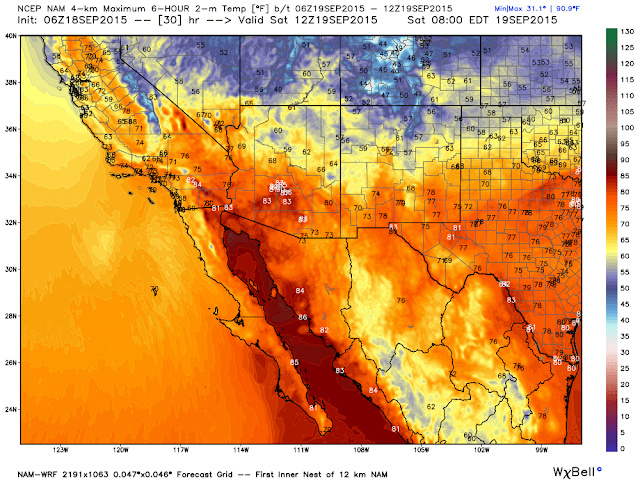 Valid @ 6 AM MDT Saturday. 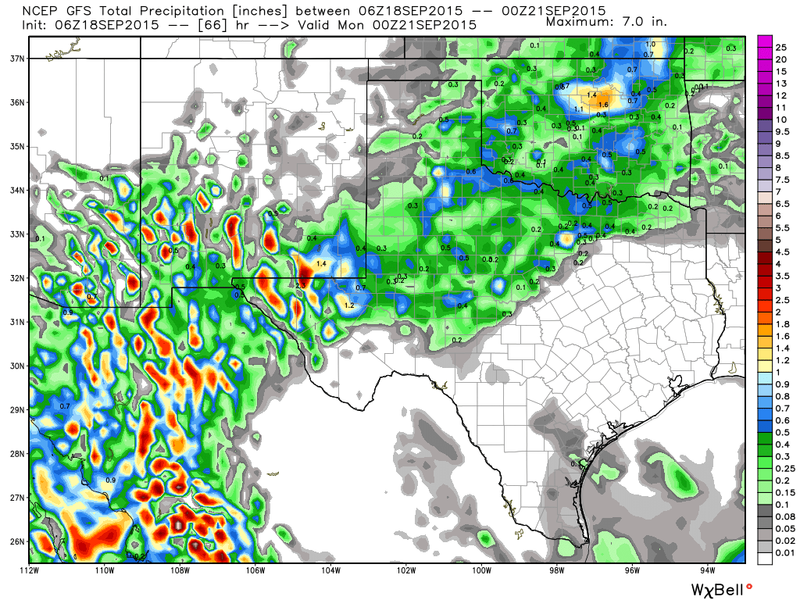 GFS Forecast Storm Total Rainfall Amounts. Valid @ 6 PM MDT Sunday. A strong cold front is forecast to work its way southward and into the local area later tonight and early Saturday morning. Once again our forecast high temperatures today in southeastern New Mexico will range from the mid 90's to near 100 ahead of this approaching cold front. Much cooler air will follow the arrival of the cold front on Saturday. 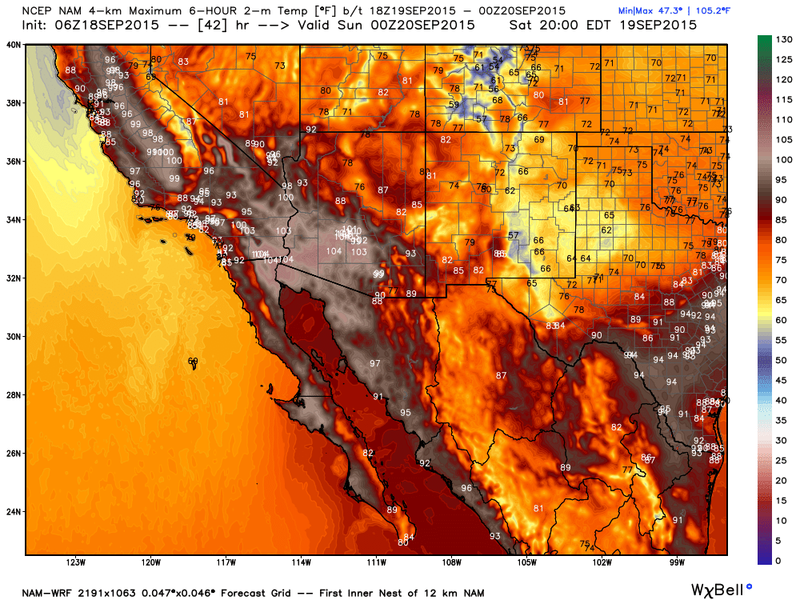 The latest run (06Z/Midnight MDT) of the NAM-WRF model forecasts our high temperatures to occur around sunrise Saturday with a slow drop as the day progresses. 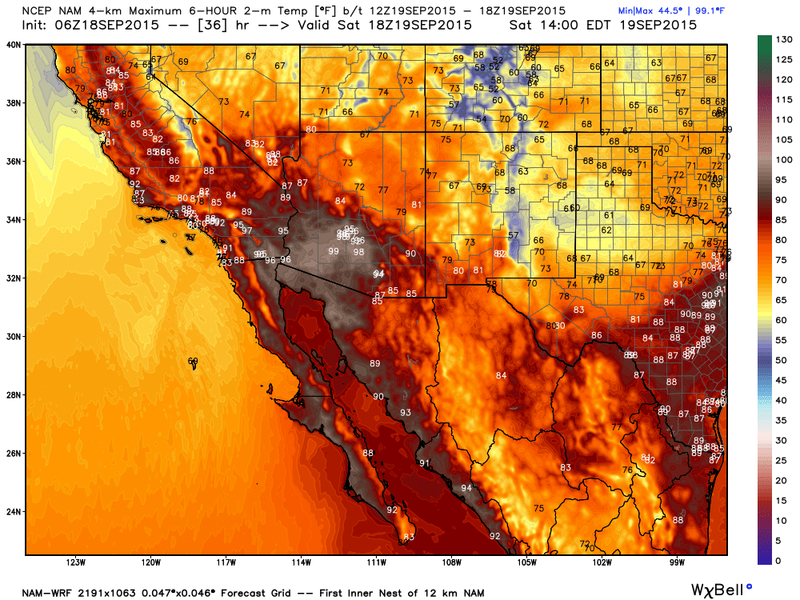 If this model is correct then most of us will see highs in the mid to upper 70's early in the morning. Note that by around sunset Saturday it has local temps in the mid to upper 60's. I sure hope that this is right...that would be refreshing. Once again scattered thunderstorms are forecast to break out locally today into tonight. Again a few of these may produce heavy rainfall, hail, strong winds, and the always dangerous cloud to ground lightning strikes. Storm total rainfall amounts by Sunday evening may be in the 1" to 3" range in a few spots. Localized flash flooding could become a concern in a few locations too.